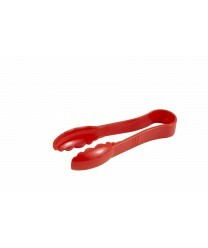 Economical and versatile, the Winco PUT-6R Polycarbonate Utility Tong, Red 6" will be used often at your salad bar. This durable serving tong, constructed of polycarbonate, is dishwasher safe and virtually non-breakable, so you can use it for serving many items at the food bar. From pasta to corn on the cob, from salad and their accompanying toppings to deli meats, the scalloped grip serving ends of these tongs ensure that transferring food from the buffet to your plate will be a success.